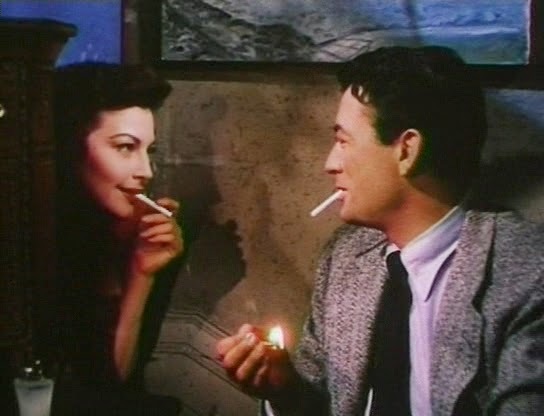 When I first saw The Snows of Kilimanjaro (Henry King 1952) a couple of years ago I was so bewitched, so enchanted, by a scene at a jazz club in Paris where Harry Street (played by Gregory Peck) and Cynthia Green (played by Ava Gardner) meet for the first time that I had to stop the film and watch the scene again, immediately. It is so wonderful; soft, tender, slow, musical, attentive to atmosphere and nuance, carefully staged and artistically lit; the room, the space is as vivid and as important as the characters in it. That is where King’s greatest strength as a filmmaker lied. In an interview with King in Focus on Film (#26 - 1977) Scott Eyman complains that while "such obviously marginal talents as Douglas Sirk and Budd Boetticher" are being celebrated by the critics, Henry King is not. To call Sirk and Boetticher "obviously marginal" is perhaps petty rather than accurate, but Sirk and King do have something in common; the incredibly rich and meticulous mise en scène; where sets, props, scale, colours, actor movements, combined with sound, music and camera movements, are done with the out-most care and artistry. 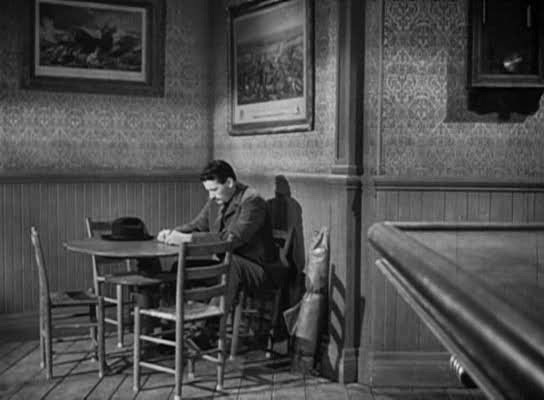 It is also something that is frequently mentioned in reviews of King's films (in her review of The Gunfighter (1950), in the Observer, C. A. Lejeune spent a lot of time describing the mise en scène - without using that word - because it has impressed her so much), and despite what Eyman may have felt, King seems to been treated rather well by the critics, and he does not seem to have had any enemies. In the 1920s he was even regarded by many as one of the best filmmakers overall, on the strength of, among others, Tol'able David (1921) and Stella Dallas (1925). They are both fine films, and Tol'able David in particular is interesting because it is close to King's own childhood. But a lot of King's silent films have been lost, and I have seen very few. Of the over 100 films King made I have about 20, and they are primarily from the 1930s, 1940s and 1950s, and it is especially the period from 1943 to 1958 that is extraordinary. That is when he made, among others, others, The Song of Bernadette (1943), Margie (1946), Twelve O'Clock High (1949), The Gunfighter, The Snows of Kilimanjaro and The Bravados (1958), all powerful, emotional and warm, made with total conviction. These are films that take their time, and the shots can go on for minutes and minutes, without very much, or even anything, happening on a surface level. King seems more interested in the inner lives of his characters, their spiritual lives, than what they do. And the mise en scène, as mentioned above, is there and the cinematography (frequently by Leon Shamroy) also glows; embedding the characters in both light and darkness, creating sophisticated depth and texture. King favoured medium shots; he wanted the whole space to be part of the images, that the background of a shot was as important as the characters. He once said that "a camera must talk", he wanted to convey the themes and the feelings visually and use everything within the frame for that purpose (so naturally he began using deep focus and low visible ceilings early in his career). This sentence from Bosley Crowther's review of The Snows of Kilimanjaro is also a rather apt summary of much of King's work "the overall production in wonderful color is full of brilliant detail and surprise and the mood of nostalgia and wistful sadness that is built up in the story has its spell". Even a completely unknown film such as Lloyd's of London (1936) has extraordinary richness, depth and tracking shots. So the mise en scène is one central aspect of his films. Two other aspects are history and religion. All of the films mentioned so far, except Stella Dallas, are set in the past, and that is true for most of his sound films. He was perhaps a man most comfortable in the past, even though he was an aviator who flew his own plane well into his 70s. About religion he once said that "I have often explored religious themes in my pictures but I’ve never tried to be preachy or holier-than-thou." although the last part is debatable, especially in a film like I'd Climb the Highest Mountain (1951), about a priest in a countryside parish. It is a lovely and humane film but, well, preachy at times. 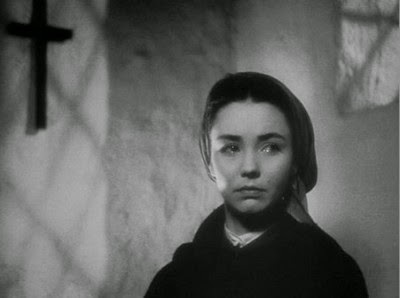 Much better is The Song of Bernadette, a film of uncommon power and strength, with Jennifer Jones as the young French girl who believes she has seen the Blessed Virgin Mary. She is a sickly daughter in a poor family (there is a shocking scene in which her father has to dispose of contagious, bloody rags from the hospital as it is the only job he can find, the kind of job nobody else would take), and neither the authorities not the church approve of her stories and her visions. It is a sometimes cruel film. I am not religious but this film moved me, all 150 minutes of it, more than I would like to admit, and seeing it again did not diminish it. It has all of King's strengths discussed above. I have seldom seen so tender and exact an attention to mood, to over-all tone, to cutting, to the edging of emotion, and to giving vitality, sometimes radiance, in terms of the image and the sound more than of the character, the story, the line, the music. Jennifer Jones especially, as Bernadette, whether through Henry King's direction or her own ability, impossibly combines the waxen circumspections of a convent school with abrupt salients of emotion of which Dostoevski himself need not have been ashamed. King would go off to a secluded location and work on the scripts, even when they had been assigned to him, and he worked on the film all the way through post-production. He was keen on the editing process to, and worked with the same editor, Barbara McLean, on some 30 films. He deeply cared for his films, and his characters, and this is of course partly why they are so good. But Zanuck was also sometimes deeply involved, not least on Wilson (1944), from the beginning to the end. Disentangling what was Zanuck and what was King is not always easy, even though it was King who was master on the set. But my research into King is still a work in progress, and there is much more to say. Suffice to say now that in 1968 Andrew Sarris put him in the category "Subject for further research" and I believe he probably deserves to be in "Far side of paradise". I will end with a scene from King of the Khyber Rifles (1953). The film is not one of King's best but good enough and on occasion wonderful. It is a tale of adventures in British India, and as such rather colonial, but the main character, played by Tyrone Power, is an outcast among the British. Although his father was English, his mother was an Indian, and a Muslim, and so he does not have it easy. In this scene he is not welcome to participate in the celebrations with the other soldiers, and is sitting by himself, when a woman calls on him. The scene has all the quiet emotions and beauty that King excelled at, and notice the expressive sound of the wind; how there are people moving about in the background, and up in the watchtower, and how the camera keeps its distance from the couple on the porch. "[T]he meditative contemplation of humanity from the middle distance" is how Walter Coppedge described King's style and that is a nice way of putting it. The best book about King was published by the San Sebastian International Film Festival in 2007, when they did a retrospective of King's films. Among those who contributed to it were Peter Von Bagh, Carlos Losilla and Miguel Marías. Farran Nehme has a fine article about Margie in Film Comment here. Both King and Henry Hathaway, whom I have written about earlier on several occasions, were at 20th Century Fox and Zanuck, but they are rather different. For one thing Hathaway frequently made films about violent men seeking revenge, and was often hard and cynical. King was the opposite of that, and disliked revenge. He was more interested in redemption. A character in a Hathaway film is much more likely to punch somebody out than in a film by King. Visually King was less showy, more subdued, whereas Hathaway was more striking and geometrical, using frames within frames for example, and sometimes flirting with surrealism. There was also a third Henry at Fox, Koster (they were known as the three Henry). I suppose I will have to write about him too some day.